Langtang and Gosaikunda Trekking is one of the best places to catch the stunning and snowy peaks like Langtang Lirung, Gang Chhenpo, Naya Kangri, Dorje Lakpa, Ganesh Himal, Choosing Langtang Gosaikunda trek offers you the opportunity to explore many small villages and glaciers at low elevation. There are better opportunities for moderate climbing excursion. You may take few extra days for more exploration. Legend says the lama discovered the valley while following the runaway Yak. Hence the name Lang is Tibetan for Yak and tang means to follow. Still Yak live in the valley but they share it with trekkers. You can vary the trek to Langtang returning to Kathmandu via the holy lakes of Gosainkund at 4300m or you can make a short trek from Dhunche to Gosainkund thousands of Hindu Pilgrim visit the lakes during a full-moon festival in August. The lakes are also sacred to Buddhists. Most of trekking routes in Lang tang and Gosaikunda are well served with Teahouse and Teahouse making independent trekking quite possible. This is particularly true for the most popular Treks, Lang Valley Trek, Lang Tang Helambu Trek, Gosaikunda Helambu Trek, holy Trek, and Helambu Trekking. The people here of Tibetan origin and call themselves Sherpa although they are quite distinct from the Sherpas of Solukhumbu both in language and customs. Also found in large numbers here are the Tamang people who also originated in Tibet but settled in Nepal considerably earlier than the Sherpas. From Kathmandu, we drive approximately for 9 hours to Syabru Besi. After driving 30 kms, we reach pristine villages on the banks of the Trishuli river. We also get chance to view the enchanting panorama of the Himalaya including the Annapurnas, Manaslu, Ganesh Himal and the peaks of the Langtang region. The day starts with a gentle climb, but it soon becomes steeper, climbing through a forest of hemlocks, oaks, maples and rhododendron. Beautiful views of Langtang Lirung (7246m) can be seen from the trail. After little more then an hour we pass two lodges in the forest at Gumanchok (2800m), from where we climb to a Nepal army post and a national park checkpoint at Ghora Tabela (2970m). 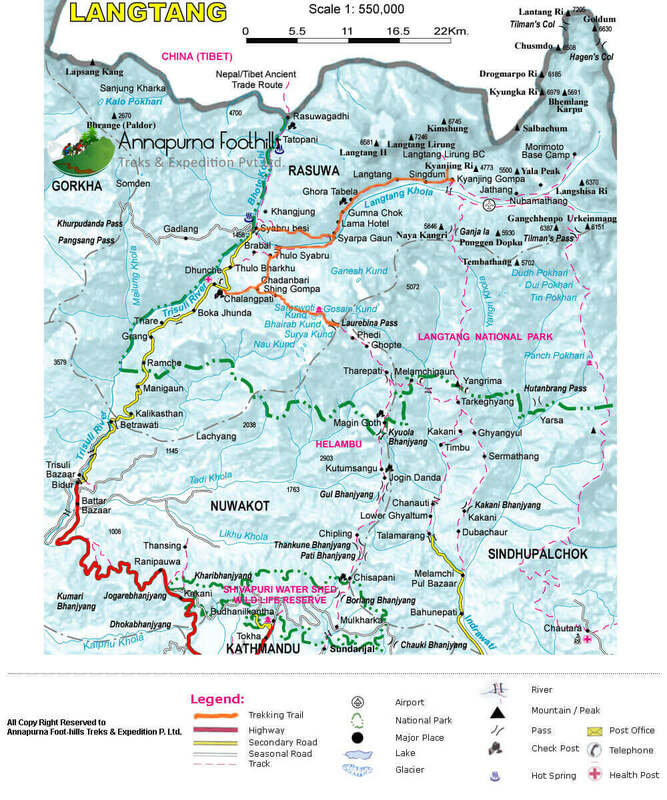 Trek from Lama Hotel to Syabru Besi via Sherpa Gaon which takes about five hours. The upper part of the trail is more beautiful for the panoramic view of mountains and green hill views. This path is more broader and remains sunny through the different Shepra and Tamang villages. The first half part of the trail is gradually down and then the trail does steeply descent to the Syabru Besi (1600m.). There was run a project called Chilime Power Plant The main inhabitants belong to Tamang community and they have adopted Tibetan lifestyle. Today we start our trek passing the gompa, school and army post, and then switchback up the steep hill above the village to Dursagang (2660m). The trail continues less steeply from now, mostly in forest of hemlock and oak to the top of the ridge at Foprang Danda, where we will have lunch. The trail to Sing Gompa cuts across the ridge top, staying fairly level as it crosses the head of the valley. After passing the final ridge at 3260 meter we will arrive at Sing Gompa. After breakfast, our city guide reaches in Hotel with Vehicles, and then we drive to Bhaktapur Durbar Square. Bhaktapur is one of the oldest cities in Kathmandu valley. It is well known as Living Museum. Old brick paved enclave of old Royal palace, Nyathapola Temple, Datatriya temple, exquisite artwork offers a picture of the grandeur of medieval Nepal. And Patan is located 7 km away from Kathmandu; this city has many 15th to 17th century, Hindu and Buddhist, monuments built during the Malla dynasty. The most important area with many monuments is the Patan Durbar Square. (Culture program) Over night stay at Hotel. You are free in the morning for the last Minute shopping or time as your own. Our driver and airport representative drive you to the airport in time for your flight back home. 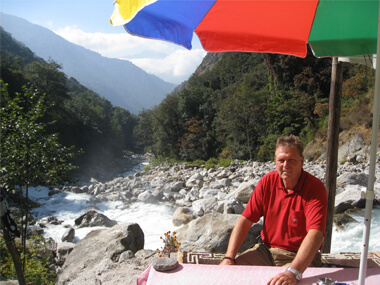 We ensure that you leave Kathmandu with cherishing memory and an experience of a lifetime.